WHITEOUT CONDITIONS AND CHAIN CONTROLS OVER THE SIERRA PASSES. And not a moment too soon. Let’s hope that it is a harbinger of a very, very wet winter. 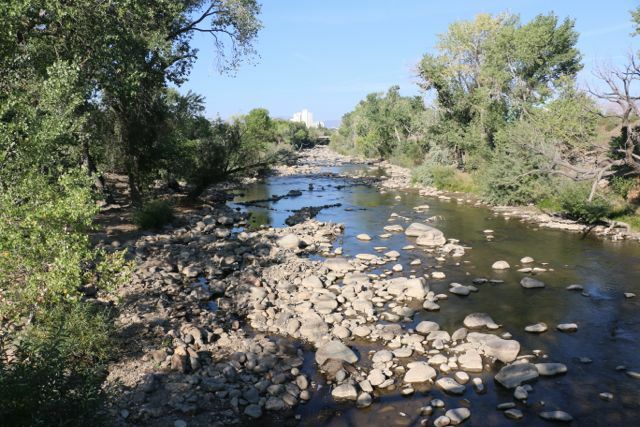 The Truckee River is a trickle through Reno at about 5% of its usual flow this time of year. Lake Tahoe is 3 inches below its rim cutting off the Truckee River from its largest source of water. Large reservoirs on the Truckee’s tributaries to the Truckee are near 25% capacity — or less. Drought is not a stranger to the region to be sure. However, this drought occurs with substantially more people – and the resulting additional demand on a dwindling resource. While, agricultural crops can be foregone in a drought, people in cities demand water regardless of how that demand affects the river and downstream environments. We are intolerant of “insufficient supply” as an argument for reducing our own water use. Right now, perhaps as much as 50-60% of the flow in the river below Reno-Sparks comes from the Sewage Treatment plant. That plant is designed to do a reasonable job of cleaning up the waste water of more than a quarter million people. Nevertheless, that treated sewage waste water is nowhere near as clean as the water that flows into this valley from the Truckee River and its tributaries. So, bring on the storms, please. One after the other all the way through May 2015. One can hope. This entry was posted in Keep it flowing on October 30, 2014 by Dennis Ghiglieri. But as we’ve written before, can we really rely on the past flows of the river to predict the future as each decade is warmer than the last? Delong provides the stats demonstrating that the concern for water supply is real, but doesn’t write how the community will deal with it. TMWA seems to be just spinning the roulette wheel. The river at Farad is flowing at 100 CFS and 57 CFS through Reno (“normal” at Farad would be 5 times greater at 500 CFS). Delong reported that Mike Carrigan, who serves on the TMWA board, favors requiring all TMWA customers be metered – especially important now that the drought has so reduced water supplies. Water meters for all customers are long overdue. Delong wrote that the average flat rate customer (not metered) uses more than twice as much water as an average metered customer – 282,000 gallons compared to 124,000 gallons – per year presumably, although it isn’t stated in the article. There are some big water users out there, too. In 2013 one residence used 6.1 million gallons of water and another used 4 million gallons. The 91st person on the list used nearly 900,000 gallons in 2013. Should a single residence be using enough water to support 50 residential customers? Should there be no limit for water use as long as the customer can afford it? As interesting as reporting the top 100 water users is, the real issue is that the more water all of us use, the less water is available for the Truckee River which is the keystone of our community and the life-blood for fish and wildlife from Lake Tahoe to Pyramid Lake. While meters are critically important to any water conservation program, without the proper rate structure and commitment by the water agency to set the rates to conserve water, customers have no reason to think about how much water they use. We discussed before that the current metered water rate structure does little to conserve water. Is that a good way to run a community? RGJ identified that some excessive water use comes from an unsuspected leak. Suspect a leak indoors or outdoors at your house is wasting water? Call the Truckee Meadows Water Authority at 775-834-8005 to set up a water audit or if you’d like to try to find a suspected leak on your own go to TMWA’s website here. This entry was posted in Conserve, Keep it flowing on October 1, 2014 by Dennis Ghiglieri.